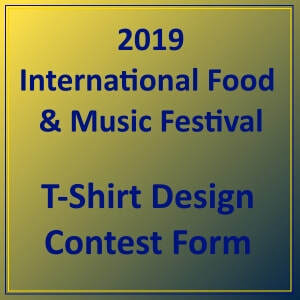 Announcing the 2019 International Food and Music Festival Logo Contest! IT'S OFFICIAL ... THE 2019 FESTIVAL LOGO CONTEST IS ON! Saint Eugene's 17th Annual International Food and Music Festival will be on Saturday, September 28, 2019. The annual Festival Logo Contest is open to all children of our parish 12 years old or younger. Entry forms are currently available in the Gathering Space or by clicking the banner to the right of this text. Entries may be submitted using the box provided in the Gathering Space before or after Masses between now and April 14th (Palm Sunday). Pre-Sales of the 2019 Festival T-shirts featuring the WINNING LOGO design will take place in June. KIDS, St. Eugene needs YOUR imagination!! What do you have to lose? NOTHING, except possibly YOUR design on this year's Festival t-shirts! Come on, give it a go....you never know!